Brining the pork helps, but the real secret is not overcooking it. According to the most recent USDA guidelines, pork chops, roasts, and tenderloins can be safely cooked to medium-rare, followed by three minutes of resting time. The lower cooking temperature will produce pork that’s succulent and tender and will likely yield a finished product that is pinker in color than most of us are used to. Restaurants have been following this standard for almost 15 years. The current temperature recommendation, announced in 2011, reflects advances in food safety and nutritional content for pork. Both the USDA and the National Pork Board suggest using a digital cooking thermometer to ensure an accurate final temperature. Note: Ground pork, like all ground meat, should be cooked to 160ºF. You can use this basic method for plain chops, but the simple sauce adds a nice touch and I know you will like it. Brining adds flavor and keeps the chops juicy and tender. Bring 1 cup of the water to a boil, add the salt and flavorings, and stir until the salt is dissolved. Add 2 more cups of cold water to cool the brine down to room temperature. 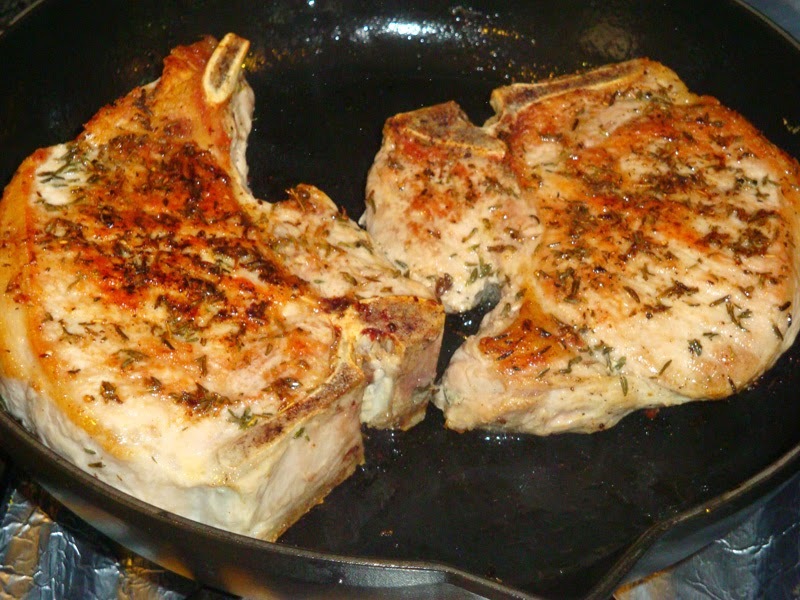 Place the pork chops in a shallow dish and pour the brine over top. The brine should cover the chops; add more water and salt (1 tablespoon salt per each cup of water), if necessary, until the chops are submerged. Cover the dish and refrigerate for 30 minutes or up to 4 hours; the longer time is better if you are not in a hurry. Preheat oven to 400°F. Place an oven-safe (no plastic handles) skillet in the oven to preheat. A cast iron skillet is ideal. While the oven heats, prepare the pork chops. Remove the chops from the brine and pat dry with paper towels. Rub both sides with oil or melted fat, sprinkle with herbs, if using, and salt and pepper. Set the chops aside to warm up until the oven is hot. Roast until the pork chops are cooked through and register 140°F to 145°F in the thickest part of the meat with an instant-read thermometer. The temperature will rise a bit during the resting time. Cooking time will be 6 to 10 minutes depending on your oven, the thickness of the chops, how cold they were at the start of cooking, and how long they were brined. Check the chops after 6 minutes and continue to check every minute or 2 until cooked through. Do not overcook or the pork will be tough! Transfer the cooked pork chops to a plate. Tent loosely with foil and let the chops rest for at least 5 minutes before serving. Pour off pan juices from skillet and reserve for making sauce. Add butter and shallots to the hot skillet. Cook over moderate heat, stirring, until softened, about 3 to 5 minutes. Add reserved pan juices and broth. Cook and stir, scraping up brown bits from bottom of pan, for about 2 minutes. Add mustard and cream and bring to a simmer. Add lemon juice and simmer until slightly thickened, about 3 minutes more. Serve sauce with chops. Sauce recipe adapted from www.Epicurious.com. Brined Pork, Mustard Sauce, Safety Tips for Pork. Bookmark. You are welcome, Lynn. I think you'll like the brine–it doesn't take long and it makes a big difference. Sorry I misspelled your name, LYNNE! could these be brined ahead of time, taken out of the brine and cooked later in the day?